Guy Jefferson was a boy living in the village of Newton-on-Ouse at the outbreak of World War Two. The nearby airfield at Linton-on-Ouse had been constructed before the war. Tholthorpe airfield was built during the war. Guy remembers both, and the bombers flying from them. His wartime experiences led to a lifelong interest in aircraft. See the Google map and links below for more information. “I remember clearly the night that Linton airfield was bombed at which time the new station commander stood on an anti-personnel bomb which killed him. I also remember several Junkers 88 bombers dropping bombs on Linton Airfield, sadly many of the bombs dropped on Linton village but by a miracle they dropped between the houses, not on top of them. The only fatality was a horse that was looking over the field gate. I remember the sound that German bombers made which was very different to the RAF bombers. The reason for this was because the German aircraft engines were not synchronized and therefore came in waves, whereas the RAF aircraft produced a steady sound. When your life depended on such matters you quickly learnt the difference. I witnessed a Heinkel 111 bomber flying very low but close to me during daylight hours, the underneath gunner was firing and only just missed me by a few feet but did hit our apple tree close by and the Dutch Barn next door. I also remember numerous enemy bombers passing overhead on their way to bomb Belfast. However, one of these aircraft developed engine problems and forced landed near the Blue Bridge, Plainville Lane. On leaving school at the age of 14 years I obtained a job as an office boy for firms that were building a new bomber station at Tholthorpe, some 15 miles north of York. I remained there for 2 years during which time I witnessed the airfield being built right through to it being occupied by two bomber squadrons of the Canadian Air Force. 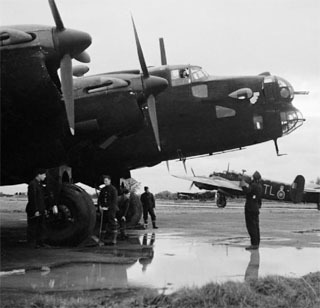 I then transferred to RAF Linton-on-Ouse when I was in close proximity to two squadrons of Halifax bombers manned by Canadians. 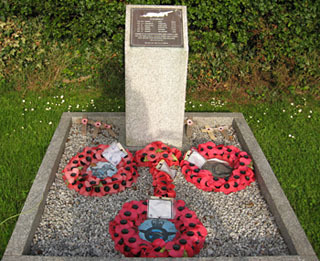 One of their Halifax aircraft crashed into cottages in the Back Lane, Newton-on-Ouse, and several aircrew members were killed. I suggested to the Parish Council that a memorial should be erected near the site to honour those that were killed. I was given the task of organising a memorial service at this site. When this was completed I helped to organise its unveiling service which was attended by countless civilians and service personnel. The Canadian Air Forces were also in attendance who kindly organised for a C130 transport aircraft do a fly-over at exactly 11am. For my efforts I was made a Honorary Member of the Canadian Air Force. Stephen’s memories and Audrey’s memories of living in York during World War 2. By Lisa @YorkStories • 10 October 2012 Beyond York, Memories, WW2 To link to this page's proper location please use the > permalink.